The Carol that’s in the comic was my attempt to show just how broken an individual can become from the zombie apocalypse. The Carol in the show, which is a much better character, let’s be honest, actually is made stronger by all the more horrible things that happen to her in the show. Killing her would definitely not…we can’t do that. So there you have it. I mean, Kirkman has been known to say certain things while doing different things, so we might very well watch Carol die at the very beginning of the next episode. But we don’t think that’ll happen. He’s got a solid point about Carol from both angles. 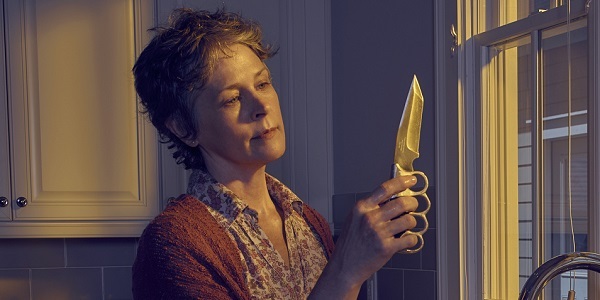 For the most part, the comic version of the character isn’t as fondly remembered as many of the other deceased folks, and while her story was effective, it doesn’t hold a flame to Melissa McBride’s victim-turned-warrior on the show. Having faced one tragic situation after the other, Carol is at the emotional stage right now where she has perfected delivering a motherly smile even while she’s raging with anger inside. (Unless someone’s asking about cookies, at which point she gets snippy.) Her motivations aren’t always seemingly set in stone, and I’m always ready for her to snap. And that’s a character trait that’s been developed and earned by McBride, and it’s just the kind of energy you definitely want hanging around for as long as possible to keep things tense. She’s strong enough to become a leader if she needs to be, but she’s also the perfect second-in-command (that’s secretly half-running things for Rick). Losing Carol would hurt this show. Speaking of Rick, he’s another person that fits into that “Do Not Kill” folder. But I could the creative team killing Rick at some point in the final season and taking the rest of the episodes to show how his death has affected everyone and everything. Daryl is in that club, too, given how much of a fan favorite he is, but I wouldn’t be shocked to see him dying off sooner than Rick or Carol, because that’d make for an unforgettable episode. According to Vulture, Kirkman said that he regrets “all of [the deaths] and none of them at the same time,” and it seems like he’d regret killing Carol off most of all. Would you guys be mad if she was killed off?